Standard Hardware & Paint is a hardware store in Kharian. This is also a paint store in Kharian which sells all brands of paints. 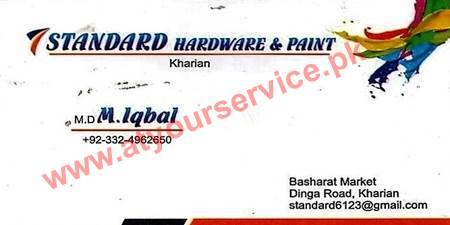 Standard Hardware & Paint is located on Dinga Road, Kharian. This is a hardware store in Kharian. This is also a paint store in Kharian which sells all brands of paints.